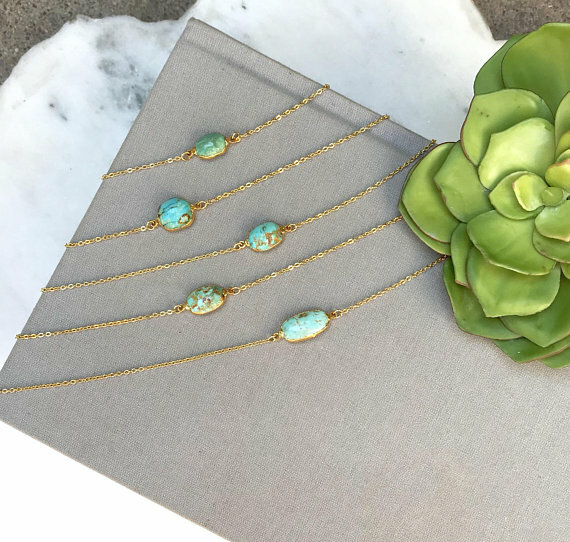 A piece of jewelry is a piece of art – and this definitely applies to the precious turquoise necklace. This gem has a way of making you think about tropical skies, blue oceans, and calming thoughts – even if you can’t physically be there. Not only is it satisfying to look at, the gem has several known healing properties. Turquoise helps your mental state by increasing serenity, creativity, and positive thinking. It is even said that it is a stone of communication, making it perfect for those who have a fear of public speaking. The healing powers are still considered extremely important today by the Egyptians, Tibetans, and Native Americans. Ancient Egyptian rulers adorned themselves with turquoise jewelry to show their great power and wealth. Chinese artisans were carving the gem more than 3,000 years ago because of its undeniable attractiveness in not only jewelry, but in pots and sculptures as well. The turquoise necklace is hard to ignore. It is eye-catching, but never too flashy or too formal. There is something about its mesmerizing color that adds a special touch to any ensemble. Read on to learn more about this necklace and why your jewelry box is not complete without one! The turquoise necklace is desired all around the world, and there is no secret as to why! Just take a look at a glowing turquoise bar necklace. The various hues of turquoise add an enticing appeal and spin to the bar necklace trend. If you’re tired of wearing the same gold bar necklace, why not switch it up? It will automatically lift your mood and take your mind off to a tropical getaway – even if you can’t physically be there. For a fun, summer date, dress up this necklace with a red tube top and denim skirt! It will add a playful, flirty look for all summer activities. For more tips, check out how to wear a bar necklace here! If you didn’t already know, we love to play with layers at Ana Luisa! We believe the key to dressing up a simple outfit is by adding luscious layers. But let’s be clear, throwing on layers all willy nilly will never turn out well for you! Be mindful of what pieces you choose so your look isn’t cluttered or messy. For a pop of color and elegance, we recommend a turquoise layered pendant necklace. Pair a short, turquoise teardrop shaped choker with a longer pendant choker. Let the longer necklace be more of a statement piece with the choker complementing it. This will be your main focal point. This will give you a timeless look for ANY ensemble. 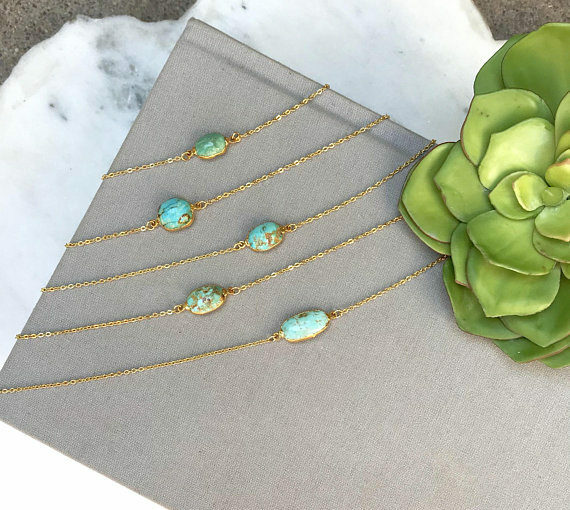 If you’re not a fan of dainty and delicate pieces, be prepared to get bold with a chunky turquoise necklace! They are just so chic and will add a boho-luxe look to any outfit. Choose one that is closer to your neck for a sassy, glamour filled look or choose one that lays across your chest for a more elegant and posh look. Pair with a strapless black dress for an evening dinner in the city with your friends. You can heal yourself AND look fabulous with this vibrant gem. A beaded turquoise necklace will bring a welcoming vibe to a basic wardrobe. The gem will automatically send you to your happy place, whether it is on a hammock by the beach, your favorite mountain peak or at home on your couch binge watching The Office (we don’t judge). The long-beaded necklace will add a classic touch to your look. Pair with an oversized black t-shirt, denim shorts, and a messy bun for the ultimate boho-cool look. For a more put-together look, wear the necklace with a cute peplum top and fringe jeans. Have we convinced you yet? We hope so ;). Try these turquoise looks and let us know which one is your favorite! Be sure to check out our blog for new blog posts every day!